This is my second pre-General-Election essay for The National, published May 6th, 2015 (the first is here). Again, after the event, it's a little painful to read my optimism for a prog majority in Westminster... but never mind Borgen, who could have predicted Corbyn? SO tomorrow – unless commercial polling is about to lose all credibility – Scotland looks like it’s going to shake up the place. Or at least, install its strong interests (and principles) right at the heart of the British State. As a spectacle of power live from London, this will be a continuously fascinating drama for us all, a real-life blend of Borgen and House of Cards. A new crowd of street campaigners, svelte professionals and outright characters will be finding their way around those encrusted corridors. If the predictions are right, their sheer numbers will compel not just the media, but the mechanics of Westminster government itself to change. I imagine Scottish political journalists are both delighted at the increased job security, and daunted by the coming avalanche of new stories to be covered. Now that the energy and activism of the indyref seems to have achieved some kind of concrete result, let’s start thinking about the next set of horizons for Scottish progress. The Scots Bloc will help bring the rest of the UK (in reality, mostly England) inside the European social-democratic mainstream. But what big challenges lie beyond the Borgenisation of everything? And how might a confident, coherent Scotland respond, and perhaps lead? In my futures work for the innovation charity Nesta, a few grand themes about what we face on the way to the mid-century keep emerging. One is automation, and by implication employment and labour. According to a range of predictions, around 45 per cent of existing jobs in the developed world will disappear in 20 years, due to self-driving cars, workerless factories, and data-crunching smart computers replacing white-collar routine. Who will this shift benefit? Well, look at who the past 20 years of digitalisation have benefitted: tech and net giants such as Apple and Google, amassing gargantuan profits while low-to-middle incomes have stagnated or even fallen. Our centre-left politicians might agree on the need for “high-skill, high-wage” economies – addressing “deficits” or welfare bills through unspecified “growth”. But left to purely capitalist devices, the prospect of automation will bring an even more economically polarised society than we have now. The only “growth” will be in the fortunes of those few who own, and those slightly more numerous who manage, these automated systems and platforms. The consequent societal damage should be obvious. That is, unless some nations and polities can strongly assert the social and human factors in this scenario. This is not a Luddite response – or at least, not as the Luddites are usually misrepresented. They were for technology that might, as their writings put it, “benefit the commonality”. And if there’s one achievement of Scotland over the past few decades, it is a rich sense of national “commonality” (or common weal). So what would a Scots response to the age of automation be – with, say, the tools of welfare and taxation at our disposal? One suggestion would be to expand the notion of the social wage, announced by Salmond in his prospectus after the last SNP electoral landslide in 2011. The social wage was a concept covering the support that the Scottish Government would give – eg, free tuition fees, prescriptions, and personal care – to establish an agreed collective social floor, from which individual Scots might rise and flourish. How might we strengthen that floor, given the prospect of millions of low-to-middling jobs and wages disappearing over the next few years? Natalie Bennett, the head of the UK Green Party, suffered badly at the beginning of the campaign, unable to provide costings for her party’s flagship policy of a citizen’s (or guaranteed) income. But it’s the underlying justification of a citizen’s income that needs to come out. EVEN in terms of global leadership, one nation must start to advocate that the productivity benefits of automation have to be distributed among the “commonality”. Now, similar to a wealth tax, no nation would want to lead on introducing a citizen’s income, given the mobility of capital and business. But Scottish politicians should be in the forefront of arguments that the EU should consider a social wage or citizen’s income as a response to the coming wipe-out of employment sectors. And we can, at a regional or municipal level, start to experiment with some of these models. The other massive trend bearing down upon all societies is the consequence of reducing carbon emissions, in order to prevent exponential warming of the planet. Technological innovation leading to greater efficiencies – like Elon Musk’s household battery, just announced – will partly address this. But the need to move away from a high-consumption-driven economy, and to reduce the material throughput of resources in our system, is more urgent than any technical fix. After the splurge and excess of 30 years of glittering though wasteful neo-liberalism, what kind of society would it take to resist the lure of the high-street or mega-mall chain stores? Maybe one that has found other sources of meaning, beauty, relationship and pleasure than consumer lifestyles? And perhaps found those in increased political awareness, an ethos of social care, an intrinsic interest in education and skills, a vibrant, participatory culture? Is Scotland that place? Mibbes aye. Yes, we need to have a macro-level argument about the oil we leave in the ground, or don’t burn off for energy. But we Scots also have human and creative resources for one of the most important collective journeys we’ll make in the next 30 years. How can we think of policy that develops and increases those resources? So we’re voting this time to reform Britain, essentially. But Scottish independence is still the best context in which we can fully imagine, and realise, Scottish progress and development. And by virtue of the standards we set in pursuit of that goal, we help progress and development across these islands, and further beyond. For better or worse, for richer or poorer, Scotland is now a “laboratory for democracy”, to borrow the words of the US Supreme Court Judge Louis Brandeis. We should be proud of that, and the inspiration it brings to many, as we make our way – thoughtfully, as ever – to the ballot boxes tomorrow. This is the first of two pre-General-Election essays I wrote for The National - this one on April 29th, 2015 - which prepared the way for my new culture-and-society column in its pages. Second one is here. Somewhat poignant: they anticipate a "progressive majority" at Westminster... which the UK Labour Party couldn't ultimately deliver. IT could have gone disastrously wrong. But it ended up ridiculously appropriate. Over the weekend, surrounded by paparazzi, Nicola Sturgeon took to a gymnastic high-bar in a photo-op with kids. Not only did the FM not fall off, but she looked like she was very much enjoying her careful progress along a narrow beam of solid possibility. Metaphor City, as the satirists used to say about William MacIlvanney’s voice-overs. There’s no doubt that the Westminster advance of the YeSNP – that is, the SNP swollen with the participants, energies and agendas of the Yes movement – will be a balancing act between various forces, requiring focus, skill and not a little bravery. But what happens when you get to the end of the beam? Do you swivel round, and just stay on? Or do you try to execute an elegant, intricate exit manoeuvre, one which – if you don’t get it right – could leave you flat on your arse, bruised, broken and maybe crocked for life? Ok, enough hack symbolism. But I’m sure I’m not the only Yesser who keeps asking themselves, ever so quietly: what are we supposed to do with this balance of power in the palace of Westminster, if it realises itself fully? Of course, take the settled centre-left agenda of Scots society to the heart of the British state. Yes, defend Scotland’s interest – not just by trying to secure more powers, but by also playing an active part in pushing UK legislation away from the neo-liberal norms of the past 30 years. The more spluttery London commentators must try a bit harder, and see the recent continuities here. An independent Scotland as a “progressive beacon” for the rest of the island didn’t happen. But a YeSNP-represented Scotland as a “progressive intervention” in Westminster is only a shift of focus, not of essence, for the Yes movement. So what to progress, while on our tour of duty? My sense is that, however currently well-matched the manifestos of the SNP and UK Labour are, the tendency will be for the Westminster Nats to keep pitching to the left of wherever the minority Labour government is. There are many reasons to do this – but there’s one that none of our UK-oriented centre-left pals should be mistaken about. Demonstrating reason, fairness, competence and principle in a brightly-lit political theatre is what convinced many Scots both to vote in two SNP governments in Holyrood, and to nearly break-up the British state via the multi-party Yes movement. THE long game of the Scots Bloc at Westminster is to build confidence among No voters in Scotland that their country has the capacities and potential to thrive as a nation-state. It might end up quite a longer game than many of us expect. But what better display of virtue than to be glowing, bright-eyed Nordic social democrats, in the cynical, crepuscular gloom of the great Palace by the Thames? As Sturgeon keeps saying, there’s no point in not being straight about this. Yet even from the perspective of indy realpolitik, a period in which strong-minded Scots MPs engage in some major reforms of the political, social and economic fabric of the British State is in a Yesser’s direct interest. The one that may seem, on the surface, most perverse is for the Scots Bloc (and allies) to vigorously support calls for UK-wide electoral reform. Very early in the process, the YeSNP has to walk its talk here. Yes, you play the system as it lays before you. But how can it be remotely just when the SNP may well get the same number of votes as the Greens, and less than Ukip nationally, yet benefit so prodigiously in terms of Westminster parliamentary seats compared to both those parties? If they wish to maintain their increase in credibility and attractiveness to the UK audience (and No voters at home), I’d recommend that the SNP either promotes, or responds to calls for electoral reform, very early in the next session. The party manifesto makes that a clear possibility – and not only that, but expresses a preference for single-transferable votes as the preferable system. But to lead on it will have a very important long-term impact. It’s a marker laid down, to be called in when we appeal to a future UK electorate or state, asking them to respect the wishes of the Scottish people for full independence. WE nearly won the first indy ref by being impeccable, constitutional democrats. If our legacy to the UK is to help bring about a lasting improvement in their own democratic culture, then that augurs well for future relations between two sophisticated, progressive countries. A New England is the best context by which we get to an Independent Scotland, by the procedural and legitimate manner which marked our first attempt. What are the “material conditions”, in Sturgeon’s words, which could even prompt another indy ref? Some imagine that the urge for independence will be dissolved in a progressive mush in Westminster. But I think the very definition of indy – that is, a full-empowered nation-state dealing with the wider world on its own terms – will receive a very early test in this Westminster parliament. What if, despite all the progressive entreaties from the SNP, Labour turns to the Tories to push through a vote on the recommissioning of Trident? In my view, far too many commentators are shrugging their shoulders here. On the contrary, if it happens this will be a spectacle that lays a seed in the minds of a potential majority for independence. A growing realisation that, without stepping up to the demands of full sovereignty, the most egregious, wasteful and endangering expenditures can happen – no matter how thumping the Scots presence in the Westminster system. So if the Unionists wish to both modernise and preserve their realm, I would suggest they think seriously about the non-renewal of Trident. Meanwhile, Nicola will be on the beam, carefully preparing herself for a full-points dismount. I wouldn’t bet against her. In the midst of my own lunchtime cartwheels over the recent Ashcroft polls yesterday – showing Scottish Labour’s potential evaporation, constituency by constituency, by the SNPs rayguns – I received a few sharp throbs of pain from some ugly old Yesser scar-tissue. You’ve been here before, pal, came the message, in distinct morse-code-like pulses. In response, let me batter out some Notes Against Complacency. Note 1: You’re not the SNP – you’re the YeSNP – so act accordingly. I’ve already had pelters for minting the phrase “YeSNP”, but I’m going to stick to it grimly for now. “ScotsBloc” might work if there was more than one party in the coming General Election stramash – there’s not. But what does exist is a party swollen by the consequences of the non-partisan, culturally-conscious, community-led activism of the Yes movement. It’s also resulted in a brace of parliamentary candidates, some great pals of mine, who came to the fore in that movement, and who – I hope – will be men and women o’ independent (as well as Indy) minds. The SNP leadership and its circles must remember that it lost a referendum on a prospectus mostly brewed up in an elite bunker. That bunker explicitly fashioned it as a play-safe strategy, whose keystone – the currency union – was as easily refuted by an implacable British state as Jim Sillars predicted it would be. The recent appeal for manifesto ideas from the wider membership is a good move. But a wise course would be to keep remembering, more than ever, that it’s the turbulent energies of a diverse movement – and a movement well to the left of the Salmond era – that’s gotten them to this powerful, unexpected post-No position. I’m still calling them the YeSNP. So there. Note 2: The YeSNP must keep engaging in a “Battle for Britain”. If the aim is to turn this early polling promise into actual SNP (oh, alright, I’ll release you for a moment) seats on the day of the General Election, the UK implications of their policy and ideological positions must be explored and extended. It’s started with the agreed “red lines” positions with Plaid and the Greens (and extended by Common Weal a few days ago). In the coming debates, I don’t think we should underestimate just how brilliant it will look to see four blustering blokes being elegantly unravelled by three smart power-feminists I’m sure Natalie Bennett will get her act together for the event). 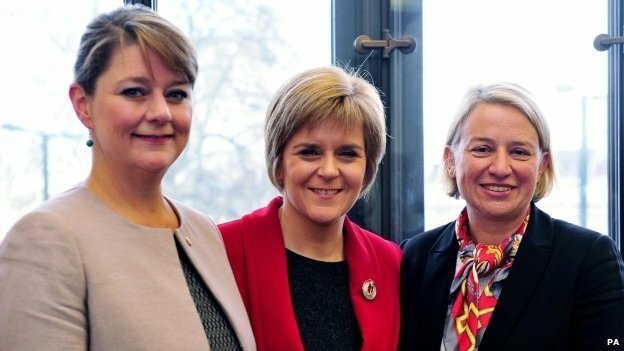 But the SNP should keep searching for allies in the rest of the island, particularly among a) the English non-Blairite labour-movement centre-left, and b) the plethora of English activist networks (like People’s Assembly, 38 Degrees, the anti-war and environmental movements, the gathering Northern regional pressure groups). Look at the diversity of activists that Compass (used-to-be Labour left pressure group, now an “open tribe”) has brought together for its Change: How? conference kicking off this coming Sunday in London. Apart from the actual presence of Scots-indy figures, what does this mix of arts, workshops, performance, idealists remind you off? Yes, it’s a “National Collective” event in all but name. The democratic carnival of the indyref has recalled the English left to its interest in the culture of politics – all that 80s and 90s invocation of Gramsci, and latterly Stuart Hall, that unfortunately got translated by New Labour into marketing strategies and Cool Britannia. Scots self-determinists have understood well for the last few decades that pluralism, and the right to self-expression, builds deep political muscles, rather than being “off-message”. We should embrace that the English left are remembering this. The “anti-austerity” and “more powers” elements of the SNP/Plaid/Green alliance are deeply attractive to these constituencies. Also keep an eye out for a revival in popular anti-Trident sentiment down south as well, enabled by new network tools and with major-name endorsement. Note 3: The UK media-establishment complex will play hardball again.So keep consuming and supporting alternative media (including The National). It’s quite a realisation – and on a bad day, a somewhat chilling one – to find that you have entirely lost faith that the BBC’s UK news operation can ever fairly represent the politics of Scottish self-determination. I’m sure many of you experienced the same shiver of cynical understanding the other day. Were the Ashcroft polls on the ScotLab collapse more like a warning klaxon than a snapshot of opinion – something fired up from one part of the media-establishment complex to awaken the rest? Doesn’t it actually herald the return of the blitzkrieg of lying, loathing and demonisation that we came to call “Project Fear” – and which, as it turned out, actually did do enough to intimidate enough Scots to keep Yes from victory? Well, if it does, then we are at least as well prepared as we were, if not a lot better. One of the salient factors in Syriza’s victory in Greece was not just its use of social media, but its access to, and support from, both a national radio station and a national newspaper for years beforehand. We know that Scots voters who were more passive and less interactive in their media consumption – older, more traditional voters – correlated more with a No voting profile. So it is incredibly important that YeSNP (it’s back again!) types and others economically support The National paper in these next few months (and its ideological sister, the Sunday Herald). The National will become, effectively, campaign literature that can be easily obtained at the street corner, and passed to friends who occupy this bracket. Let me be clear – this makes no request for either paper to change its existing editorial policy. The National needs only be as committed to its desired, front-page outcome – “an independent Scotland” – as the Record is to its “Vow”, “Vow Plus”, or whatever variation of Labour Unionism it traditionally supports. Yet I don’t want to downgrade that we’ve managed to build, and maintain, an alternative public media sphere in Scotland after the referendum, out of zeros and ones (and the steady commitment of writers and readers). Newsnet.scot has come about as a fusion of the old Newsnet Scotland site, and Derek Bateman’s passionate podcasting and blogging. Bella Caledonia maintains its preeminence as the home of progressive Scottish thinking and writing; Wings Over Scotland continues its necessary and meticulous media monitoring, “watch the watchmen”. And commonspace.scot a project of Common Weal – is picking up speed as a vital aggregator of progressive-left Scottish (and global) content from across the Net, including these sites and many other independent bloggers. When any of them make their appeals for cash, as they doubtless will in the next few months, respond as well as you can. You literally pump oxygen into the largely airless abyss of mainstream Unionist media in Scotland. And, at least until May, we do seem to have squeezed two regular, nightly political programmes out of the budgets of STV and BBC (though for how long, who knows). Merely from necessity, these shows have an appetite for new guests and voices, which figures from the indy media sphere in Scotland often provide. We should regard them as targets for intervention with interesting stories, angles and events. Note 4: Stay awake. Keep talking. Do what you can. Whatever’s happening, and whatever the outcome, it’s better to be busy being born than busy dying in the post-referendum Scotland. And it’s a lot better than I expected it would be. That’s definitely worth a little throbbing scar tissue.